About 8 or 9 years ago I finally had an apartment to myself, no roommates(! ), and in celebration went to the closest liquor store and picked up a bottle of Tequila. OK, it was Jose Cuervo. I already had OJ in the fridge, and had picked up a bottle of grenadine at work. It was a time in my life where I thought it would be adult of me to have a small ‘bar’ at my place. This was fancy for me; I was in my early twenties. Having picked up my first cocktail recipe book, I had decided on making a Tequila Sunrise. This was a cocktail name I had heard before, it was less scary than some of the other recipes in the book and I knew all the ingredients (even if I had no idea what went into grenadine). You have to start somewhere. The other day, flipping through one of the Bum’s cocktail books, I realized I had no grenadine in the house. That lone bottle I bought some 8 or 9 years ago had stayed with me through several more apartments, a couple boyfriends, and my own wedding. Its existence being extinguished at one of our Tiki parties two years ago. I hesitated to go buy a bottle. 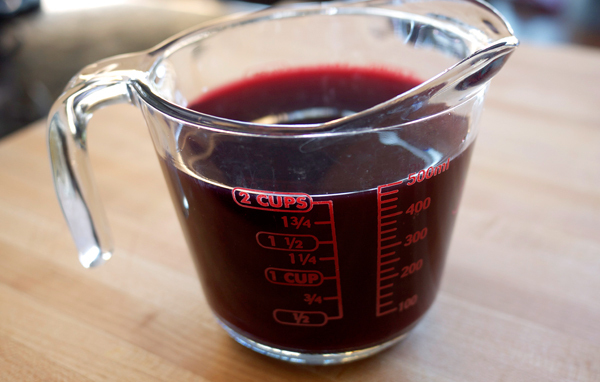 There are more bad reviews of grenadine out there than good, and I recently had been reading about just how easy it was to make it. There are two approaches one can make their own grenadine with: the cold method (pomegranate juice and sugar shaken together until the sugar is well incorporated), and the cooked method. I went with the cooked method. Taking inspiration from the SippitySup blog and the Imbibe site, I combined a method I was happy with. I wanted to keep it simple, and the addition of the orange flower water gives it just the subtlest floral hint without being too perfume-like. 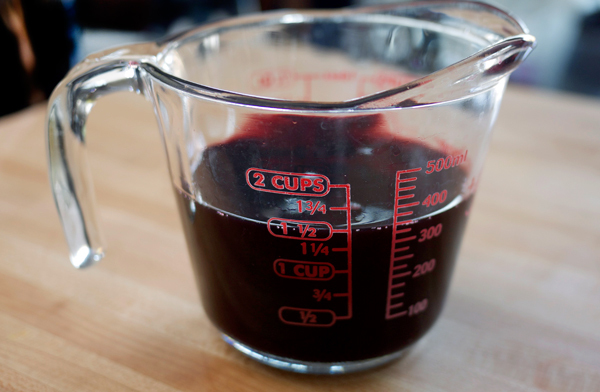 Combine juice and sugar in a pan over high heat. Bring to a boil then leave at simmering until reduced by half (I ended up with about a cup and a half). This can take 20-30 minutes. Remove from heat, add the orange flower water and leave to cool. Once cool, stir in vodka and bottle. Couple notes here: Why heat? Testing the cooked method, I enjoyed the more syrupy consistency of the end result. It also resulted in a more intense “berry” flavor. Does orange flower water taste like orange? No. Have you ever smelled fresh blooms on an orange or lime tree? It’s like that, floral, not citrus. Reminiscing about the grenadine, I thought, for nostalgia reasons, I’d make a Tequila Sunrise to test out the final batch. With a couple of tweaks it was just as satisfying as I remembered drinking it standing in my ‘bar’ of that first studio apartment.This time around, I juiced my own oranges in a rather large batch (I am finding new uses for this juicer we just committed to buying), which, because of how sweet they are this season, I decided on adding a touch of lime juice. And to round the whole drink out, a few dashes of Scrappy’s Aromatic Bitters. In a shaker 2/3 filled with ice, combine tequila, orange juice, lime juice and bitters. Shake well to combine and strain into a chilled cocktail glass. 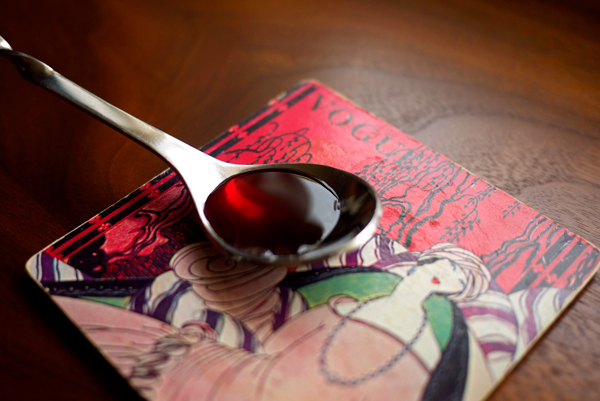 Add the grenadine to the center of your drink so it drops to the bottom of the glass. Stir gently with a bar spoon and watch as the colors float up. A touch of sweet earthiness from the grenadine floats throughout the drink. 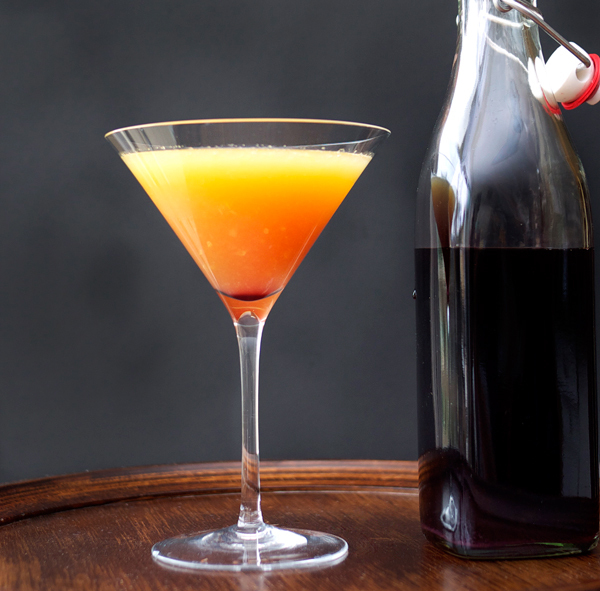 I know that in this case it’s mainly a beautiful way to add color, but the richness of the syrup cuts through some of the sweetness of the orange juice too. Those bitters provide a subtle balance to the drink, that tends to just be very citrus forward and not much else. Never tried making it with orange flower water. great shot of the cocktail btw. Never seen a tequila sunrise actually look classy. Thanks! It took a couple of tries to get that drink to look classy. oooh. Fabulous. 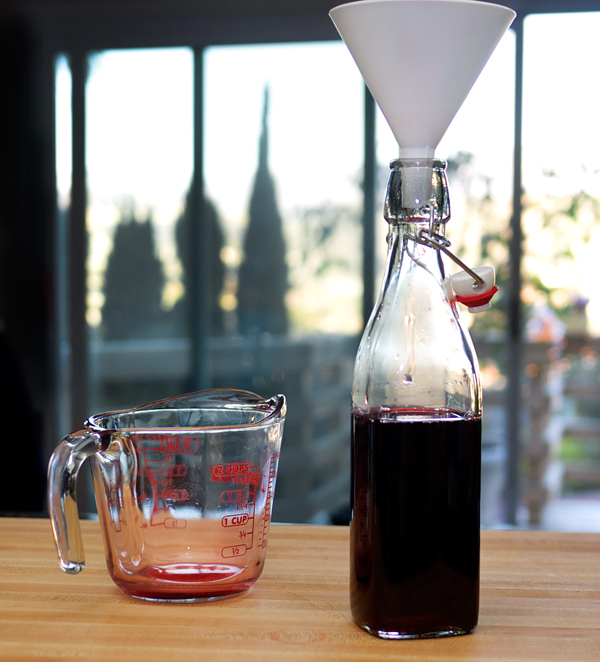 I made grenadine for the first time last year and loved it. Now I’m hooked. Thanks so much Kara! Hope you find some more recipes you’ll like. How long will it keep in a sealed jar/bottle? Leave on counter or keep in fridge? Where the heck do you get orange blossom water? Are you only using the vodka if you aren’t using it up in one go? I’ve kept my bottle in the fridge and it’s been around since Feb and still totally fine. We just used it tonight actually and it’s still pretty dynamic. And yes, the high proof vodka is a preservative. Without it, I think it would last more like 3 months in the fridge. That’s usually the shelf life I’ve had with syrups I’ve made when I haven’t added any liquor to them.. I always stash the homemade stuff in there, except for infused liquors or bitters. 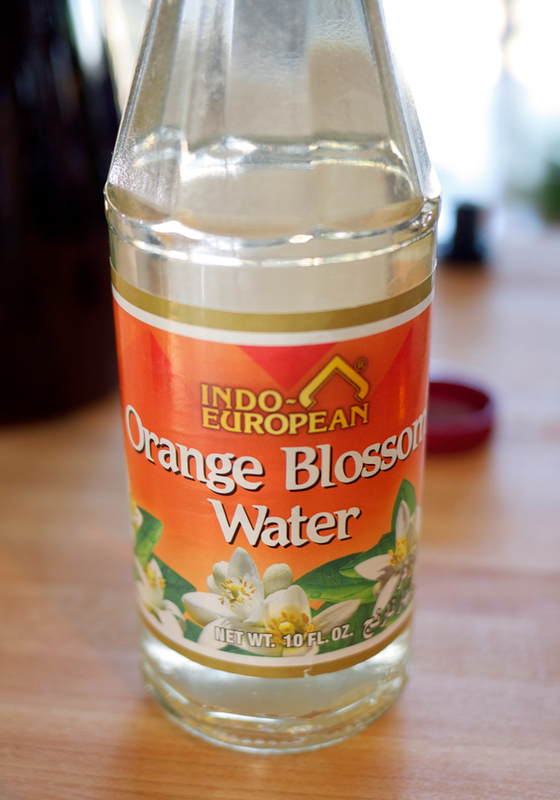 Orange blossom water is actually pretty easy to find. I’ve seen it at Whole Foods, and on Amazon . Ethnic stores, like if they have Turkish food, I’ve also seen it at. Hope this all helps!